We’re still in July 2010. Progress was slow, but dogged. Montcrief’s translation is deservedly famous. In college I read these same pages in French, an effort of which I have no memory; yet for 40+ years I’ve kept that slim volume, with its famous beginning: “Longtemps, je me suis couché de bonne heure.” I can struggle through the short sentences now, but the longer ones make me grateful to Montcrief. So anyway. We’re still at Combray, during the narrator’s childhood, and he spends the first few pages thinking about that tea, and his bed-ridden aunt who drinks it so often. She gets a great deal of pleasure out of watching the villagers’ to-ing and fro-ing below her window, and then gossiping with her maid, Françoise, about what she sees. But the other half is luxuriating in all the detail — the imagery so clear, it’s like an episode of “You Are There.” You see the lime-tree buds and leaves slowly unfurling in the tisane, you see the spring woods from which those buds were harvested, you smell the aroma and taste the soaked madeleine. And then you casually move to Aunt Léonie and her bedroom, to Françoise and her delicately stiff cap, to the feel of the gold coin in the narrator’s hand before he hands it to the maid. It was hardly light enough for me to read, and my feeling of the day’s brightness and splendour was derived solely from the blows struck down below, in the Rue de la Cure, by Camus (whom Françoise had assured that my aunt was not ‘resting’ and that he might therefore make a noise), upon some old packing-cases from which nothing would really be sent flying but the dust, though the din of them, in the resonant atmosphere that accompanies hot weather, seemed to scatter broadcast a rain of blood-red stars; and from the flies who performed for my benefit, in their small concert, as it might be the chamber music of summer; evoking heat and light quite differently from an air of human music which, if you happen to have heard it during a fine summer, will always bring that summer back to your mind, the flies’ music is bound to the season by a closer, a more vital tie — born of sunny days, and not to be reborn but with them, containing something of their essential nature, it not merely calls up their image in our memory, but gives us a guarantee that they do really exist, that they are close around us, immediately accessible. There’s a tiny kerfuffle as the household prepares for the local regiment to march by, another when Bloch, one of the young narrator’s friends, insults the family (one of the great quotes: in response to the narrator’s father’s question about the weather, Bloch replies, “Sir, I am absolutely incapable of telling you whether it has rained. I live so resolutely apart from physical contingencies that my senses no longer trouble to inform me of them.”) And a humorous aside when the narrator visits his uncle Adolphe on the wrong day and meets the wrong sort of woman — but only to explain why the uncle no longer visits them at Combray. I’m going to have to pick up the pace somehow–at only 30 pages a week, it’ll take me nearly 3 months to finish! But there’s only so much of this that I can get through in a day. Imagine a box full of the best chocolates–how many can a person eat before becoming not just sated but positively surfeited? Proust alone would be a heady literary diet, and I have to cut the richness with lighter stuff. But onward and upward. Excelsior! More next Friday. Actually, it’ll be “more next Monday”; I have 8 more posts to reblog here, enough for another 4 weeks of immersing in Proust’s world before I head into completely new stuff. 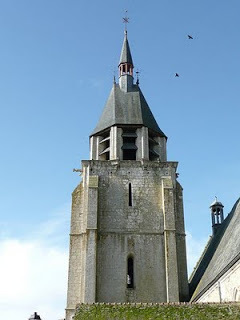 And another thing: somehow in this post I didn’t mention Proust’s visits to the local church, and the first notes of anti-Semitic feelings in his family. According to the Introduction in my French edition of Combray (1952, ed. Germaine Brée and Carlos Lynes, Jr.), “Combray announces the themes and establishes the structural patterns of the novel as a whole.” I won’t be providing all that in my summaries, but I hope I can at least give these a passing nod. Thanks! That is certainly my plan.